The Chicago Botanic Garden's Lake Enhancement Program continues to improve water quality, heal eroded shorelines, and enrich aquatic habitat in its 60-acre system of lakes. The Gardens of the Great Basin, completed in 2002, greatly expanded its aquatic plant collection to include tens of thousands of aquatic plants native to Illinois. The Chicago Botanic Garden, with its world-renowned plant collections and displays, is one of the country’s most visited public gardens and a preeminent center for learning and scientific research. The Garden features 23 display gardens and three native habitats, uniquely situated on nine islands surrounded by lakes. The 385-acre living museum is owned by the Forest Preserve District of Cook County and managed by the Chicago Horticultural Society. The Garden is open every day of the year, except Christmas, from 8 a.m. until sunset. The Garden is located on Lake Cook Road in Glencoe, one-half mile east of the Edens Expressway. Admission is free; select event fees apply. Parking is $15. On Tuesdays, senior citizens age 62 and older pay just $7 for parking. The Chicago Botanic Garden is a BGCI Patron Institution, and hosts BGCI's U.S. office. The Garden is accredited by the American Association of Museums and is a member of the American Public Gardens Association, the Association of Science-Technology Centers, Chicago Wilderness, and the Center for Plant Conservation. Special Collections:Specialized: Baptisia, Geranium, Quercus, Salix, Spiraea. 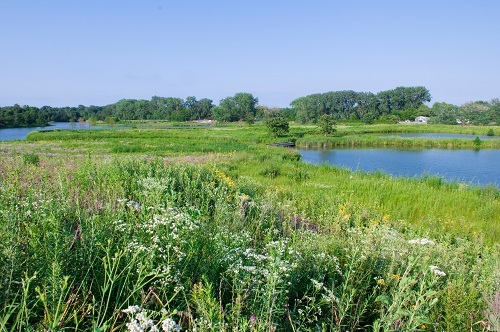 Approximately half of the property of Chicago Botanic Garden (CBG) is under ecological restoration, including 100 acres of oak woodland, 15 acres of prairie, 20 acres along a river corridor and 80 acres of lakes/lakeshores. The Garden also consults on restoration projects throughout the greater Chicago area. It maintains a regional seed bank which has the goal of having 15-20 accessions from each of 2500-3000 native species from the upper Midwest. Currently there are about 1500 species banked. A project is being piloted to use vacant lots in the city to grow locally-sourced, locally-grown, native seed for restoration projects in the region. At a national level CBG participates with the Seeds of Success (SOS) and Native Plant Materials Development (NPMD) programs. The Seeds of Success National Collection contains more than 16,500 seed collections which are stored at the USDA Agricultural Research Service facilities. CBG plans to continue building the seed bank, producing seed for restoration, determining best practices for ecological restoration and conducting research related to restoration ecology. Click here to find out more about Chicago Botanic Garden restoration projects or contact Kayri Havens. 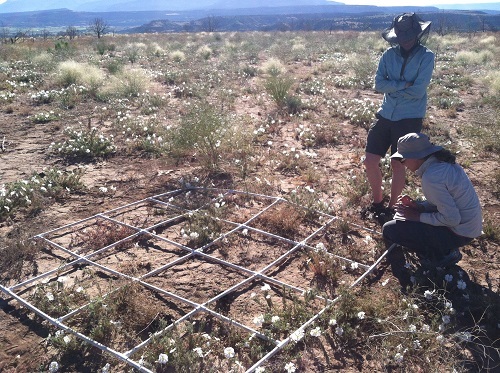 Scientists and graduate students at Chicago Botanic Garden are supporting implementation of National Seed Strategy and the Colorado Plateau Native Plant Program’s (CPNPP) 5-year Strategy and Action Plan to help improve restoration outcomes in a changing climate. Chicago Botanic Garden scientists are utilizing the concepts of ecological succession and evolution to identify species characteristics, species mixes, and source populations that may produce more effective re-vegetation outcomes in degraded habitat (including habitat invaded by cheatgrass and knapweed) in the Colorado Plateau. Since 2012 CBG has worked with Seeds of Success collectors, Bureau of Land Management Field Offices, the CPNPP Science Program Lead, and interns with the Conservation and Land Management program to build SOS collections of these identified species and populations (i.e. ‘native winners’) across the Colorado Plateau. CBG scientists are utilizing these collections for germination, greenhouse, common garden and restoration research trials. 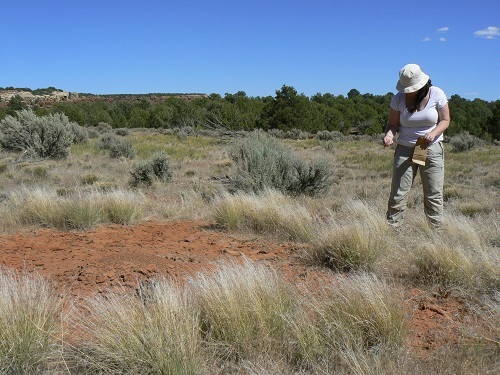 These trials serve as initial sources of information for seed growers, on propagation, cultivation, and harvesting techniques for the species, and for land managers, on which species and sources are most effective in restoration of degraded habitat. Finally, they also serve as a source of bulked seed to be used for future, larger-scale re-vegetation research. 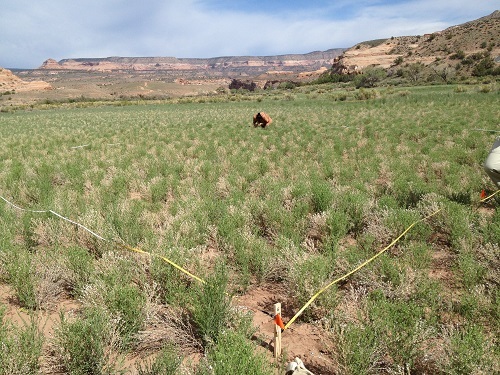 CBG scientists are also working on retrospective studies of revegetation outcomes for different species and seed sources used in the Colorado Plateau over the last 10 years. Specifically, this project is: 1) identifying and make data available on seeded species and sources used in treatments via the Land Treatment Digital Library (LTDL), Utah Watershed Restoration Initiative (WRI) and other sources (including native and introduced species, as well as cultivars and source-identified seed); 2) synthesizing data to determine region-wide trends of success for different seeded species and sources used (and to determine the feasibility of more in-depth research linking seed source to revegetation seeding success); and 3) making results broadly available to land managers to support decision-making that minimizes the risk of revegetation seeding failure. Please contact Andrea Kramer for more information about this project. McDonald Woods is a 100-acre remnant oak woodland at the northeast corner of the Chicago Botanic Garden on land owned by the Forest Preserve District of Cook County. The woodland encompasses five community types: northern flatwoods, mesic woodland, dry-mesic woodland, upland forest, and savanna. Although the site was historically subjected to the negative influences of agriculture and logging, it retained remnant populations of six state-listed plant species. The site also is noteworthy in that it contains several species not found before in the Chicago region: Carex digitalis, Deschapsia flexuosa, and Carex hyalinolepis. Since restoration and management began in 1988, the woodland now supports self-sustaining populations of Aster furcatus, Carex tuckermanii, Carex formosa, Carex bromoides, Oenothera perennis, and Viola conspersa (state-listed species). Baseline inventories of herbaceous, shrub & tree populations, small mammals, birds, butterflies, mycorrhizal fungi, bryophytes, litter spiders, mites & springtails have been completed. Ongoing surveys are looking at the response of each of these groups to restoration. 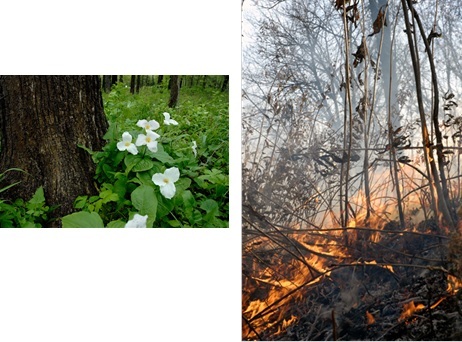 Restoration and management has involved (and continues to involve) removal of invasive species; seeding to enhance existing plant populations and re-establish species thought to occur historically; and controlled burning. Read more about this project on the Chicago Botanic Garden website, here and here. Click here to watch a video about the ecological restoration work at Chicago Botanic Garden. Saturday, October 18, 2008. 8 a.m. to 5:30 p.m.